It was on TBS when I was a kid and I remember watching it every afternoon. It didn’t bother me that the castaways had an endless supply of clothes or The Professor couldn’t fix a boat or they could fashion anything and everything (except a boat) out of coconuts or that nobody lost weight or died of scurvy or how those other people came and went and the castaways were always stuck. I was only concerned with the fact that Gilligan was silly and did silly things and Mary Ann should have been his girlfriend and the Skipper should have had some more patience. 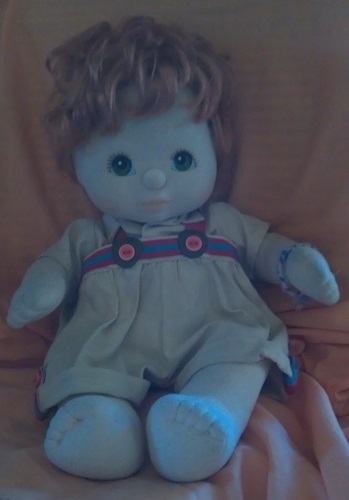 I was so taken with the show that I named one of my dolls Ginger Mary Ann. Except I spelled it Jinjer Maryann because five year olds are crap at spelling. Also the doll was probably supposed to be a boy, but it had red hair like Ginger and it had a sweet face like Mary Ann so I decided it was a short-haired girl. Anyway, it was the only doll I ever named after characters on a TV show, therefore, it’s noteworthy. I can remember daydreaming about being on that island with the castaways. I would have helped Gilligan and wouldn’t have made him feel like such a screw-up, even though everything he touched pretty much exploded in his face. Even at five, I felt very protective towards Gilligan. I related to him because he was like a kid. He tried his best, but he messed up a lot. He was goofy and playful and seemed like the most fun. It’s not that I didn’t like the other characters; I did! I could have made my doll a boy and named him Gilligan, but I didn’t (she looks nothing like a Gilligan anyway); I named her after two of the girls. I was fond of all the castaways. Little did I know that this show would set me off on my course. Like the Minnow’s two-man crew and its five passengers, my young self set sail in a sea of entertainment and like the inexplicable pull of that uncharted island, I’ve repeatedly found myself washing onto the shores of reruns, particularly when my life’s been stormy. I realize now that the shows I’ve liked best are the shows that remind of that fantasy world comfort I first experienced with Gilligan’s Island. No, the shows I love aren’t all silly, but there’s something about them that involves me yet puts me at ease the way the antics of the castaways did. Only for me would naming a doll after a character establish the gold-standard of a television show.